The table below covers the heat scale for the most popular Indian curries that you will find in a standard British curry house. 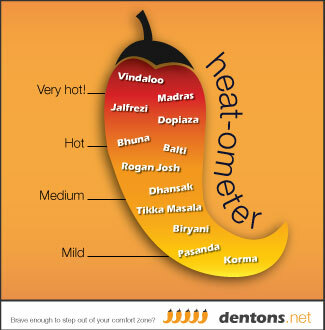 We love a curry at Dentons and our Indian curry hotness guide shows curries in order or hotness starting with a mild korma curry at the bottom to the vindaloo at the top of the scale. View our guides to Indian main dishes and curries and Indian side dishes.